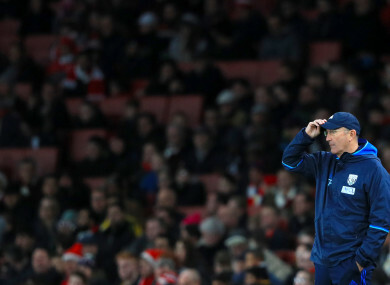 TONY PULIS HAS been sacked as West Brom head coach after a dismal run of form that leaves the Baggies in danger of relegation from the Premier League. The former Stoke City boss has garnered a reputation as a survival specialist, but West Brom have stalled in 2017, winning only three Premier League matches since February. Two of those victories came in the first two games of the current campaign before a torrid 10-game winless run began, with West Brom’s latest result a dispiriting 4-0 home reverse to champions Chelsea. Owner Guochuan Lai watched on as sections of the Hawthorns support chanted for Pulis’ sacking and the club have now acted as they sit 17th in the table. Club chairman John Williams said in a statement released on the club’s official website: ”These decisions are never taken lightly but always in the interests of the Club. Pulis departs after almost three years at West Brom, having previously managed Stoke and Crystal Palace in the Premier League. The 59-year-old has been linked with the vacant Wales job following Chris Coleman’s resignation. The Baggies, meanwhile, have placed assistant head coach Gary Megson in temporary charge of first-team affairs. Email “West Brom sack manager Tony Pulis as Premier League slide continues”. Feedback on “West Brom sack manager Tony Pulis as Premier League slide continues”.